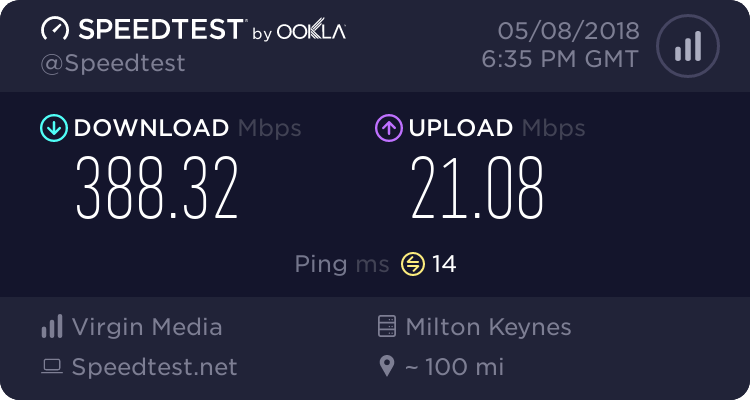 Am going to seriously look into going 4G with an all-you-can-eat deal and combining that with DSL for resilience as mobile network does very occasionally disappear for a few days and dies when there are any mains power distribution problems and always after lightning strikes. AA offered to research 4G modems for me. 4G dongles for the Firebrick present hassle with horrible setup and internal non-transparency - some are like a mixture of NIC and router as they can apparently interfere with the traffic and do NAT internally. If a horrid mobile ISP also does IPv4 carrier NAT themselves that could be double NAT. Anyway L2TP tunnelling would make all that crap go away and get IPv6 going. AA themselves do a nice 4G/3G service but it’s way too expensive for heavy use, charged by the byte. It does nice static IPv4, but incredibly no IPv6, which is the fault of either Three or the intermediate service provider AQL, whom AA uses to link them to Three. I don’t think it would be a very good idea to use an IPv4 router like the Solwise 4G-to-2.4GHz 802.11n router that I have and connect that to the Firebrick. I think there would be many difficulties if not using PPPoE and a modem into the Firebrick. Question: if I used two 4G modems simultaneously and IP-bonded them using the usual AA+Firebrick technology, how would that do in terms of performance on the 4G network? I realise that the two would be contending with each other. I don’t know whether there are collisions or not. Would it be a way of greatly increasing throughput? At double the cost of course. I get 8Mbps downstream and 2.8 Mbps upstream (presumably TCP payload figures?) reported by speedtester2.aa.net.uk with my iPad on 3G when in bed. This is right st the back of the east-facing bedroom. The base station itself is in clear view to the east when at the window. However lying here I am at the wrong angle and too low down. I would get 4G mode if I moved to a better position in the room. A modem used in the office with the Firebrick would get a superb view of the base station and would be in 4G mode. Not sure what speeds can be expected in 4G. I have seen an all-you-can-eat 4G deal from Three. It is, I think, £27 per month for a data SIM which is incredible. I can’t be reading that right. That looks like the way to go. I could use that together with DSL as a fallback. We've been here before, giving loads of suggestions such as external aerials, if fact I suggested exactly what you are now proposing and you totally dismissed the idea rather abruptly. My advice is keep it simple to start with and build on it from there. Back in the Black Friday sales you could get that sim for £20 a month, Robertos on think broadband did away his VDSL and uses it instead I believe. Maybe get one of those sims and put it in an old/spare IOS device and share the connection with wifi (tethering). You can then put the IOS device wherever you get the best signal reception. For best results Weaver needs an external aerial as IIRC the reception is not great. Ronski is indeed right. My apologies completely if I was abrupt, emotion and tone is not conveyed well electronically. So my most sincere apologies. When I dismissed the idea before I believed that 4G was ridiculously expensive. Also I had not thought of doing L2TP to AA. Nor had I thought of bonding/failover between 4G and DSL. Also there were problems with 4G kit being really awkward which I could not see a way past. So I owe Ronski a great public apology. I suspect he is better informed about such things than I am. I don’t know if things have changed, but I was shocked by seeing the recent low price for 4G. It may be that Ronski knew about these prices when I did not (my ignorance), or it may be that they are a new development. So yes indeed we have been here before. Back then DSL was really very reliable, with less than one fault per line per year iirc. Just recently we have had a run of faults with no end in sight and that obviously made me revisit the 4G thing. At that point I discovered to my amazement that it is extremely affordable. As for the aerial, I am in direct line of sight to the base station across the valley from the office window. The distance is 6250m to the BT Kinloch site according to mastdata.com. So in the window all should be good. In bed with my iPad things are not so good because I am too low and to far back in the room, so my iPad switches down to 3G not 4G and gets 8Mbps downstream 2.8Mbps upstream. I am not sure what I would get with 4G in the window.mim guessing st perhaps 16Mbps d/s don’t know what upstream. @underzone Have done this during a major outage. Also did this when in hospital. Stuck my BlackBerry Z10 phone in a window and had my iPad in bed, BB creating a wireless LAN and connecting to 3G or 4G when in Inverness. At home I have an emergency Solwise 4G to 2.4GHz 802.11n router too, with two external antennae which Mrs Weaver has buried (lost). One major reservation, an illogical long-term whinge of mine, is the worry about what happens if another user takes all the bandwidth. It may be however that in a location such as this there are very few users, with such a low population, and especially very few serious data users if most are phone users. So practically I can get away with it. This could have been part of my earlier ‘anti-Ronski’ [humour, apol] mind-set. But now I have realised that I could always fix that by bonding with dsl anyway if need be so there’s little reason to not use 4G in that case, since if you bond the entire lot together it can only be an improvement on DSL, ‘cannot be worse’. AA said they would look into modems for me. Does anyone know anything about pppoe 4G Hugh performance modems? I didn’t know that such things existed, if they do exist, that is. In my ignorance, I have only heard of routers, myfi, 4G/3G-to-802.11 routers and USB dongles or laptop cards. I would ideally want something aimed at business users/sysadmins not home users so as to avoid problems some of the devices have with annoying features that get in the way such as routing and NATing, which I have been warned about in the case of the 4G dongles tested by AA a couple of years ago and written up in their support website. On the other hand some performance figures were good and I am not in London. However one can try it for 14 days, and I can bond it to DSL too whereas those users have not done so. I can do some tests now as my current AA SIM uses Three > AQL > AA. Another excellent tip from that thread was the Mikrotik SXT LTE device. I would have to find my mains-to-POE injectors as Mrs Weaver May have filed them. I am not sure what the input is, 24V DC and it says you get a POE injector with it in a kit, but not sure whether 24V is the input as well as the output or what. And I’m hoping it might speak pppoe but can’t see any stuff about protocols just now. What kind of problems do you forsee? Any 4G router (assuming it has an ethernet port) should work fine - you just need an ipv4 connection to route your L2TP tunnel to A&A over (a few layers of NAT shouldn't affect it). No need for modems and PPP - you just give the Firebrick an address on your 4G router's LAN and use that for the outgoing L2TP tunnel. The only downside I can think of with L2TP is that you'll get a reduced MTU. Also, I'm not sure bonding 4G and DSL would work - I would expect a significant difference in latency. Thank you for the apologies Weaver, very much appreciated. I don't know much about 4G but at the time I'd done some research due to your BB issues and I could clearly see it would most likely perform better than what you have and certainly be cheaper. I also figured that in a low population area you shouldn't be too congested. I've been with Three for a long time, having the original One Plan many year's ago, I've always used my phone on holiday for tethering, sometimes reception was bad but over the years it's generally improved. Due to a WiFi issue at home I now always use 4G on my phone although I'm very close to the cell tower. Unless you really try you'll never know, and a proper external directional antenna will vastly improve things. There’s a review linked to in the TBB thread. The author talks about the scary ‘Trafficsense’ throttling that Three applies. One user reports scary horrible performance figures. Since I would be using it flat out at times this would be a nightmare, far far slower than DSL. I skipped through that thread the other day the user that got throttled had hammered the connection solid for 3 weeks until he hit 1TB of data. They only throttle to 2Mbps so no worse than one of your lines really. I really doubt you'll see the congestion you'll get in a busy city where you are, and even if it does slow is it really going to be as slow as ADSL? I can't remember when I last used my phone and had a poor connection, there will always be someone somewhere having a bad experience.